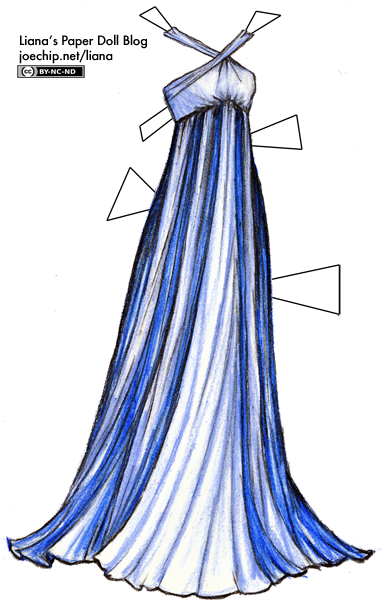 Taylor posted that she thought that the purple gown I put up recently seemed to her to represent “air,” with the other aimless color-centric gowns I’ve been doing recently representing other elements. I looked at the comment, then looked back at the dress, and somehow felt anxious: if that’s air, it’s certainly not a windstorm I want to be stuck in. If it is representing an elemental, I suppose it might be Shade from the Mana series… Really I had no such intentions from the start, so I’m not saying this is meant to be air, just as the others weren’t particularly meant to be earth, water, fire and so on (the orange one’s name was purely descriptive); I drew it without a narrative beyond “It’s gonna be blue. Blue, and light, and pretty.” But it is a pleasant idea that these aimless gowns have an underlying theme, unseen to me. I’m happy, though. It’s good to be here. I’ve written a long post about the move, but not only does it feel more personal than what I usually write for this blog, I also don’t know what kind of paperdoll outfit should go with it. So you may or may not see that, depending on whether or not my normal creativity comes through for me! Oh my, I want a dress like this! Lovely dress, as always. I think there’s something wonderfully organic about all the dresses- perhaps it is the rough lines- but it also makes them feel a little otherworldly to me. Perhaps it simply takes time to get back into the flow of things when it comes to paper dolling… I have spent many hours staring at white paper myself and therefore sympathize with the dilema. I LOVE this dress. I actually gasped when I saw it. It would be so beautiful in rel life, so elegant and almost magical! Like someone said above, I would love to wear this dress. It’s so pretty! I love it and I wish I could win a contest someday! Love the idea of element-based dresses! I often do that with my own paper dolls. I also like to do season themes. Spring, Winter, Summer, Fall. What if you did a set like this: Summer Fire, Fall Water, Spring Earth, and Summer Air? This dress is fabulous. As always, Liana doesn’t disappoint. I especially love this color. This kind of dress would be perfect with a shawl. I could easily picture this on a woman in a meadow. (Yes, a bit silly, but isn’t that how writers should think?) Great work, Liana! LOOVE IT! This is one of my favorites, I gotta say! I have a request. Could you possibly do a Greek Goddess dress? I love Greek mythology! This is one of my favorites, it’s just so pretty. I kind of like it better than all the detailed dresses. It lets you imagine more and so it has more of an otherworld look. Wow. it’s simply beautiful, and the dark blues are like, magical. Perhaps you could do something from Princess of Glass by Jessica day george….kind of childish book, but there are tons of dress ideas. Like, my favorite is a purple with a smoky gray tissue that makes it look all silvery purple. Oops, sorry, Kelly! I meant Winter Air. Rather frigid, don’t you think? Oh, me? I’m sorry if I made it seem that way I really meant it in friendly manner :) I tried adding the lol to prove this. No, don’t even worry about it I would have made the same mistake I’m sorry if it seemed rude I really am not a rude person. I just meant to notify you plus it seemed like such a great idea that I wanted to know the rest (I wasn’t sure if summer was air or fire). I hope you don’t think that I’m mean or anything! :) sorry! Do you mean the ‘winter air’ part or Kelly? Well I like this dress , even if it’s not as polished as some of the others you’ve drawn. It’s flowing and pretty. Side note.. I’m pretty sure Tori was referring to winter air, not Kelly, “frigid” means “very cold in temperature” after all. I second Kenzie’s request! I’m a Grecian girl too. cute!!! I love it and how do you draw so good?! Your SO better then me! Way better remember to try my blog a few more posts is on it! Good luck on your PERFECT PAPER DOLLS AND CLOTHES! The dresses do seem to have an elemental theme to them, but the purple & blue dress seems more like lightning/thunder element (if you play rpgs you know that thunder is an element, just like ice ;). So, Liana has made fire, earth (or planty for the emerald gown), thundery, and water (this one and the mermaid gown from 08/26). Or you could say the green dress was air, since a lot of rpgs like to make air element green. I’d like to see a, earth toned one for, well, earth. And this one could actually be an ice element one… it’s got the white and pale blue. This dress was posted on my birthday!!! man i love this dress….! are these dresses has been sale in somewhere?